Reviewed by Maria Conway on November 29, 2016 11:08 pm . If you’re the type of person who likes to look on the bright side of life, then Costa Bingo will tickle your fancy as it’s about to make your online bingo experience a whole lot sunnier. 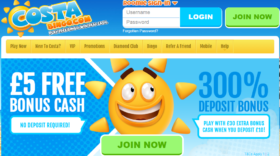 Launched in 2009, this little ray of online bingo sunshine is one of the fastest growing sites in the UK, with a huge following of bingo fans that continues to grow every single day. The site has more free bingo games than any other bingo site, plus huge guaranteed jackpot games with life-changing cash prizes waiting to be won. Costa Bingo uses the powerful Dragonfish software platform so you know what to expect when it comes to games and functionality. The overall web design is clearly well thought out, simple and pleasant-looking. 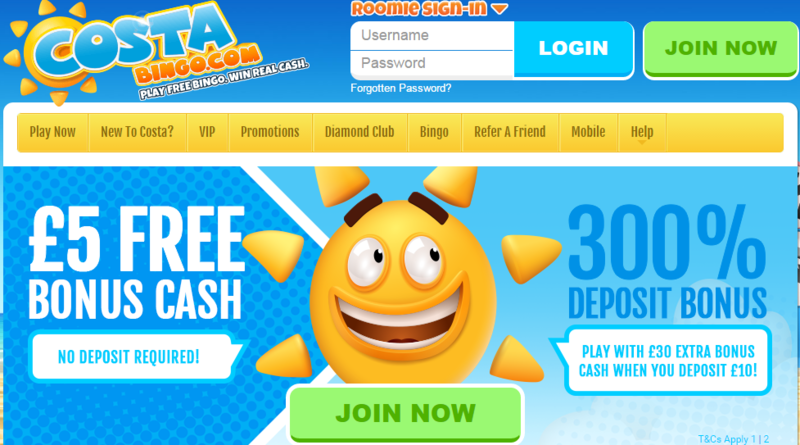 The homepage is warm and welcoming, featuring a blue and yellow color scheme with bingo balls scattered all over, added by the site’s iconic smiling sun logo. The navigation system is extremely user-friendly and players have easy access to all useful information and links, making the site comfortable to play at. New to CostaBingo? If so, you’ll get warmed up with their generous welcome bonus offer of 500%. Simply deposit £10 or more into your account and you’ll be topped up with an additional free £50! That’s not all because you’ll also gain free access into their First Time Depositor Freebie game where a guaranteed £15 pot prize is waiting to be won every half hour. Regular players at Sun Bingo will also be entitled to a 50% reload bonus on subsequent deposits of no less than £10. In addition to the 500% deposit bonus new players can avail of a £5 completely free bonus cash. You’ve read that correctly. £5 completely free no deposit required. The true wonders of the site begin the moment you sign up and play bingo. Players will enjoy over 50 rooms of fine bingo entertainment, with plenty of opportunities to win hot jackpots. The site offers a wide array of 75-ball and 90-ball bingo games with ticket prices starting from as low as 1p going all the way to 25p. This brand is also well-known for their guaranteed online bingo games which are played on a daily basis. Lunch Hour Loco is a favorite among players, offering a £200 guaranteed pot prize everyday at 1:30PM. Join the Costa Party every night at 10PM and you might just win yourself the £250 guaranteed jackpot for a card price of 10p each. Go loco with Costa Crazy every Friday night at 9:30PM where a guaranteed jackpot of £1,000 is up for grabs. The minimum amount of cards per player is 3, with cards costing 10p each. Come and relax at Costa Paradise every last Thursday of the month at 9:30PM and get the chance to win a hefty £2,500 guaranteed jackpot. Tickets cost 10p each and the minimum amount of cards per player is 6. Make sure you won’t miss anything by checking out CostaBingo’s Pre-Buy section. There are pre-purchase jackpot games available, with ticket prices as low as 1p for Lunch Hour Loco, Two to Tango, Cost-A-Penny and Tequila Double games. The company is a melting pot of free bingo games with amazing prizes all yours for the taking. There are free 75-ball and 90-ball bingo games playing every half hour of the day starting at 8AM, with a jackpot of £50 guaranteed. Funded players can win up to £2,500. Costa Bingo isn’t just about bingo. The site is brimming to the lid with games that you can play alongside bingo. Help yourself with over 70 instant win games, slots and casino style games. When it comes to slot machines, players are spoilt for choice! You can choose from Lucky 7s, Monkey Paradise, Old MacDonald, Pirate’s Gold, Lucky Spell, Fruits Machine, and many more. Up the ante with Costa Bingo’s collection of super slots including Bejeweled, Aztec Rising, Cleopatra, Fireworkz Frenzy and Doting Doggies, among others. If you prefer progressive slots, the company doesn’t disappoint because it’s home to popular slots such as Shaman’s Dream, Irish Luck, Fluffy Favourites and Piggy Payout. You could win up to a staggering £30,000 cash prize! Figures will continue to rise until a lucky player wins the pot prize. If you’re a fan of instant win games, then you can try your luck with Scratch Cards, Quickfire Lotto, Multiplier, Hollywood Stars, Hi/Lo, Keno Fifteen-o, Video Poker and a whole lot more. If you prefer more traditional casino games, you can choose between roulette and blackjack. Play in cash bingo rooms and you can partake in chat room games. Who knows, you might just earn yourself some extra loyalty points. It really won’t cost you a fortune to play here at CostaBingo, so why not play now and win some fab prizes? Loyalty doesn’t go unnoticed here at Costa Bingo wit their unbeatable VIP scheme at Diamond Club. Depending on your VIP level, you can receive special gifts and promos, from bigger-than-usal deposit bonuses all the way to cashbacks and exclusive bingo games. You can earn loyalty points the moment you sign up and fund your account. Wager in bingo and selected side games and you can earn even bigger points. For every 1,000 points earned, you can redeem £1 in bonus cash so the more points you earn, the more benefits you can reap! Players at this site can be assured that the site can be trusted to deliver security and privacy. All of the games are fully-audited and extensively tested to ensure fair play and honest payouts. Security is ensured with a SSL certificate from Thawte. This company is a subsidiary of UK bingo giant, Cassava Enterprises, Ltd, both licensed and regulated in Gibraltar by the Gibraltar Gambling Commissioner.